The leading ASP.NET web hosting provider DiscountASP.NET announces to offer all readers from the web hosting review site Top-Cheap-Web-Hosting.com with 50% discount for first order, pricing at $5/month. The professional ASP.NET web hosting company DiscountASP.NET announces a special 50% promotional link for all readers from Top-Cheap-Web-Hosting.com. The effective price of their rich-featured ASP.NET web hosting plan is down to $5/month from $10/month, which is quite competitive and affordable in the market. DiscountASP.NET is the Microsoft Golden web hosting partner and recognized as the leading ASP.NET web hosting provider in the field. Unlike other web hosts, DiscountASP.NET only focuses on providing Windows web hosting solutions that they have accumulated rich experience in the operation and management since 2003. It’s proven that they’re consistently providing 99.9% uptime by using 100% DELL servers which have 2x Intel XEON E5440, 32GB DDR3 memory, and RAID 5, offering extremely powerful computing ability. In the past a few years, DiscountASP.NET has won numerous awards from publications such as Visual Studio Magazine, .NET Developers Journal, ASP.NET PRO Magazine, DevProConnections Magazine and CodeProject. If their ASP.NET hosting services/support were not in high quality, they would not have won these awards especially from infusive websites. 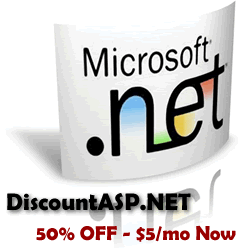 DiscountASP.NET provides ASP.NET web hosting based on the platform either Windows2003 or Windows 2008. The web host support .NET Framework 1.1/2.0/3.5SP1/4.0, ASP.NET MVC 1/2/3, Silverlight 2/3/4. Unlike other web hosts offer illegal and poor-performance MS SQL Server Express edition for shared web hosting users, DiscountASP.NET supports local MS SQL Server Compact DB by default, and provides standalone MS SQL Server web edition on extra $10 for a month, which is much more scalable and reliable. To learn more about DiscountASP.NET, visit http://www.top-cheap-web-hosting.com/web-hosting-promotions/discount-aspnet-50off-special-offer. Top-Cheap-Web-Hosting.com (TCWH) is a leading web hosting review website. TCWH, reviews web hosts unbiasedly based on the true experience and feedback from real customers. The mission of TCWH is to help people find the best web hosting deals, and save time and money from a bad choice. Visit Top-Cheap-Web-Hosting.com.